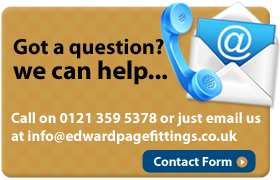 Edward Page Fittings have a range of bench and wall mounted laboratory gas fittings. Each range includes 1 way, 2 way ( 90° ), 2 way ( 180° ), 3 way and 4 way Bench Fittings and 1 way and 2 way Wall Fittings. Other pattern ranges are available upon application. . Traditional drop fan, safety range finished in plated black bronze.